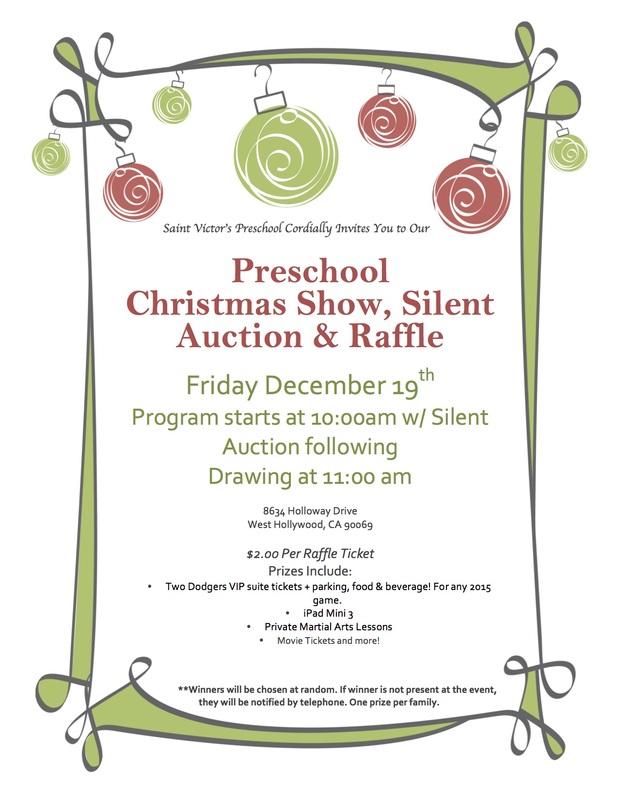 Saint Victor’s Preschool is proud to announce its 4th Annual Christmas Show, Silent Auction and Christmas Raffle! The children will be performing various Christmas songs and our very own special version of The Nativity. In addition to the Christmas show, there will be a silent auction and Christmas Raffle. The silent auction will include one of a kind artwork created by the children. The Christmas Raffle’s prizes include an iPad Mini 3, 2 VIP Dodger Tickets, Private Martial Arts Lessons, and much more! Support the preschool and buy raffle tickets today! Tickets are $2.00 and available for purchase at the preschool office, Saint Victor Church Office, and through any current Saint Victor’s Preschool family! We hope to see you all at the Christmas Celebration!